As 2017 chugs out, flexible packaging specialists are busy projecting trends that will shape the contours of the industry through 2018. Let’s run through the top 5 trends as we brace up for a happening and exciting year ahead. Light Weighted Packaging: Amid ever-growing concern for environmental sustainability, flexible packaging which both by default and design happens to be far more energy-efficient throughout the three stages of its life-cycle i.e. manufacturing, transportation and disposal than its rigid counterpart, light weighting will be the top R&D priority for packaging engineers globally. The race to develop thinner laminate structures without compromising upon the overall barrier, functional properties and the strength of the packaging is going to get much tighter. This is attributable to the Pull by the Conscientious Consumers hence the Brands much as it is to the Push by Convertors catering to them. In 2018 one can hope for even higher product to package ratios. Re-Configuring the Packaging for Zero Moment of Truth (ZMOT): Today’s consumer is well travelled, well read, well connected and never too far from the smartphone. The First Moment of Truth (FMOT) which has been an important guiding factor for FMCG brands selling through the Brick and Mortar set-up till date is fast being replaced by the Zero Moment of Truth (ZMOT). During the ZMOT a consumer researches about the product online and tries to gather as much information as required for making an informed choice at the Point-of-Sale (POS). In fact ZMOT is now being acknowledged as the very enabler for FMOT. While ZMOT is much about the quality of the products, the line between it and FMOT is getting blurred by the days with consumers expecting real time information about the product while shopping in the super market. 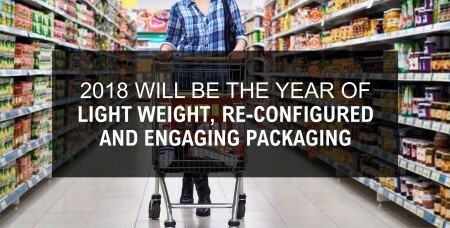 Given the burgeoning demand, Flexible Packaging in 2018 will have to be re-configured for ZMOT and to be able to do so; Internet of Things (IoT) will come very handy. Intelligent features like NFC, QR and Scan Codes on the packaging should be able to cull out all the information about the products the moment a smart phone is held up to it. Packaging engineers and researchers will not leave any stone unturned for integrating intelligent features compatible with the latest hand held devices. IoT will in fact be very useful for smooth logistical interventions throughout the supply chain. This will trigger disruptive innovation in the field of flexible packaging optimizing the overall value proposition for all stakeholders across the value chain. No-Occult Packaging: Since the inception of flexible packaging, Aluminium Foils have been used in laminate structures for providing fool proof barrier to oxygen and water vapour saving the product packed inside from spoilage. The biggest disadvantage although is an opaque pack where consumers are unable to see the product packed inside. There is a growing demand for transparent barrier films that can replace aluminium foils thereby offering a sneak peek into the products at the POS for taking an informed purchase decision. Foil replacement polymeric films are likely to be a trend setter in 2018. Packaging as a crusader against food waste: Amid growing realization that one third of the food produced for human consumption goes waste every year, Active Modified Atmospheric Packaging for extending shelf life of perishable fresh produce (like fruits, vegetables and flowers) and anti-microbial packaging that modifies the environment inside the food package thereby altering the state of the packaged food system and its headspace to enhance its quality by extension of shelf-life, enhancement of sensory qualities, and maintenance of microbial safety will see an encouraging uptrend. Packaging that Engages and Connects: The more the packaging engages consumers at the POS, the higher is the probability for the transaction to sail through. Tactile Effects on flexible packaging with the help of special printing technologies will be a real shot in the arm for high impulse buying FMCG items. Such packaging is likely to be abuzz and happening all through 2018. Personalization and customization knows no bounds. Flexible Packaging is bracing up to a whole new level where bespoke profile shapes which the consumers can relate with will be a rage and this is one trend that will get cracking in 2018. Picture this: Protein-shake formula packed in a sleeve splitting biceps shaped flexi-pouch makes a high-decibel pitch to fitness freak shoppers. Doesn’t it? A detergent pack profiled as a T-Shirt is potent enough to create interest among the shoppers. Being India’s largest multinational flexible packaging materials and Solution Company Uflex always stays ahead of the curve to offer the most advanced, innovative and efficient packaging to its clients globally!